Website design (saint-mary.org.uk) and catechetical guides for the Catholic parish in West Croydon, England. Website design (www.ourladyhernebay.co.uk) and catechetical guides for the Catholic parish in Herne Bay, England. Editing, copy-writing and design of Reculver Church of England Primary School's 2014-15 prospectus. Website design (www.southwarkdsc.org.uk) and branded bookmarks for the Spirituality Commission, Archdiocese of Southwark. Editing and design of the Members' Directory for the Guild of Our Lady and St Joseph in addition to posters, booklets and prayer cards for the Guild's publicity. Banner, publicity cards, flyers and programmes for Guild events. 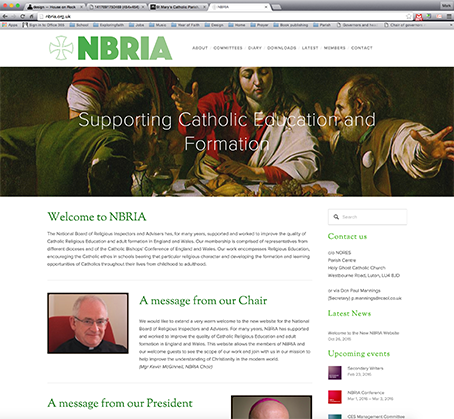 Website design (nbria.org.uk) for NBRIA, a national board of education and faith-formation advisers in the Catholic Church. Editing and design of the Diocese of Westminster's 'Red Book' (a guide for those involved with Catholic schools in the diocese) and a companion guide for diocesan inspection of schools.